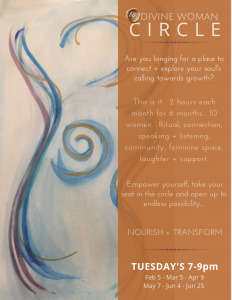 Are you longing for a place to connect with yourself and other women… a space to flourish? Did you know there is scientific research that women respond differently to stress than men? Much of the stress research we’ve read about has been primarily based on men… such as the fight or flight response. After stressful experiences, women instead tend to nurture more + touch more. When we gather together, our levels of oxytocin raise, our heart rate + blood pressure lower to counter the effects of stress. Women THRIVE when we are in a community + our outside relationships also thrive. When we process with other women, we stop putting expectations on our significant others to be EVERYTHING for us, we learn how to speak our truths in a safe container, so we can then speak more clearly in the world, we experience joy + inspiration as we witness our sisters growing. In these circles we SHOW UP for ourselves + each other in a way that is not always the norm out there. They are a sacred space of sisterhood, where we COMMIT and in doing so, are exponentially uplifted together! Location in Midtown Atlanta. Your presence is requested at each meeting as we create this sacred container together (we ask that you only miss 1 meeting max if need be). Sign up below if you’re interested + we’ll let you know when the next spot opens up!